Participants of the One Woman Show talk at the Swiss Design Awards 2018. I was honored to moderate the One Woman Show talk which took place at the Swiss Design Awards exhibition during Art Basel week. 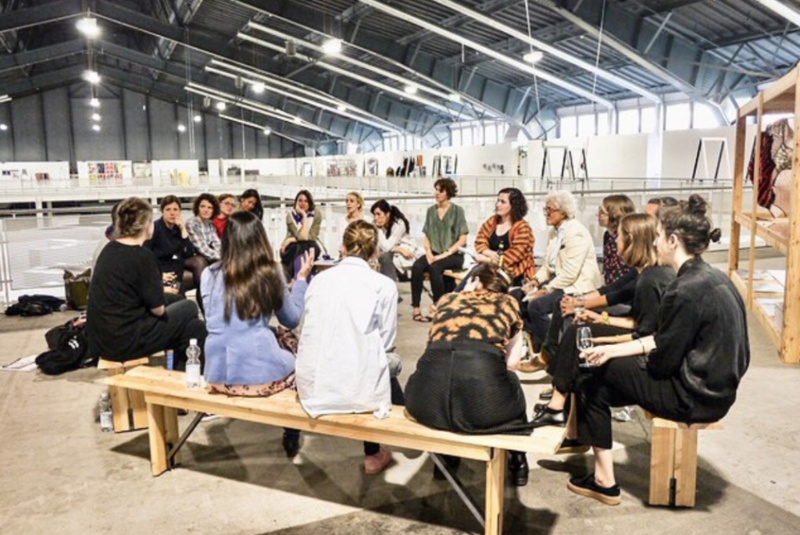 Organized by the Bundesamt für Kultur with the Zurich chapter of Ladies, Wine and Design, the event sought to explore how women work independently as designers and creative practitioners. Discussion topics circled around business and creative leadership, working independently, courage in creativity, work ethics and how to go from fear to freedom. We were lucky enough to be able to hear insights from multiple generations, with participants including Rosmarie Tissi, Cécile Feilchenfeldt, and several of the designers exhibiting as part of the Swiss Design Awards exhibition of this year. The conversation provided an interesting space for the sharing of many different stories, and it was fascinating to see how many of the challenges faced by previous generations are the same – albeit in different scales – as those of the practitioners of today. I am thankful for this opportunity, which was an incredible learning experience. 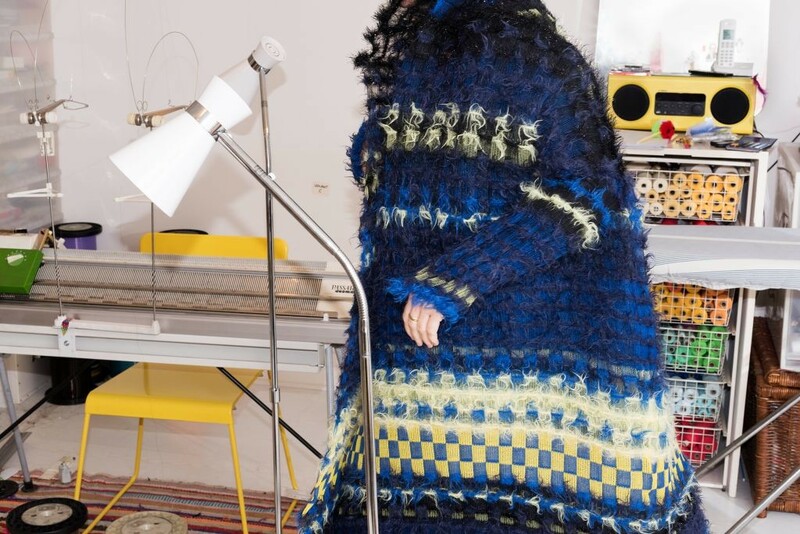 An impression of the atelier of Cécile Feilchenfeldt in Paris. Photo Marc Asekhame. In May we presented the results of the latest volume developed for the Swiss Grand Award for Design series. The 2018 laureates of this award, given annually by the Swiss Confederation and the Federal Office of Culture, are Cécile Feilchenfeldt, Rosmarie Tissi and Felco. Once more I had the pleasure to interview all these wonderful practitioners and help make the book that celebrates their professional achievements. This year, the photos were by Marc Asekhame, and the graphic design by Krispin Hée. Spreads from the Swiss Grand Award for Design 2016 publication. 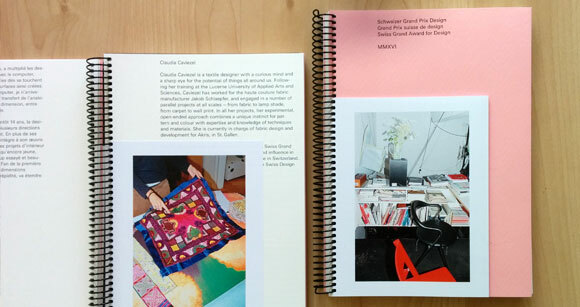 I was delighted to edit the publication celebrating the 2016 edition of the Swiss Grand Award for Design, a career prize bestowed upon distinguished Swiss designers of all fields. This was the tenth year of the award, which is given by the Swiss Federal Office of Culture, and the winners were Claudia Caviezel, Hans Eichenberger, and Ralph Schraivogel. I had the pleasure to interview them and get to know better their work and practice, and it was also fantastic to work with the Federal Office of Culture, in the person of Patrizia Crivelli, and designer Jonathan Hares.